Does everyone feel better? I hope so... because reading your rants made me feel better. I think some of you had some things to get off your chest. So because I am feeling generous there are two winners. Why? Because I'm can never pick just one. Kristen from Going Country was the 18th comment with her slug rant. So Kristen and To Chicken To Leave Her Name, you both won! Woo-Hoo! E-mail me at evilchefmom [at] aol [dot] com with your address and name so I can send you your trick or treats. I would've and should've had a most entertaining post today but I am a little preoccupied right now. Stay tuned because tonight I have a whopper of a story for you. Huh. 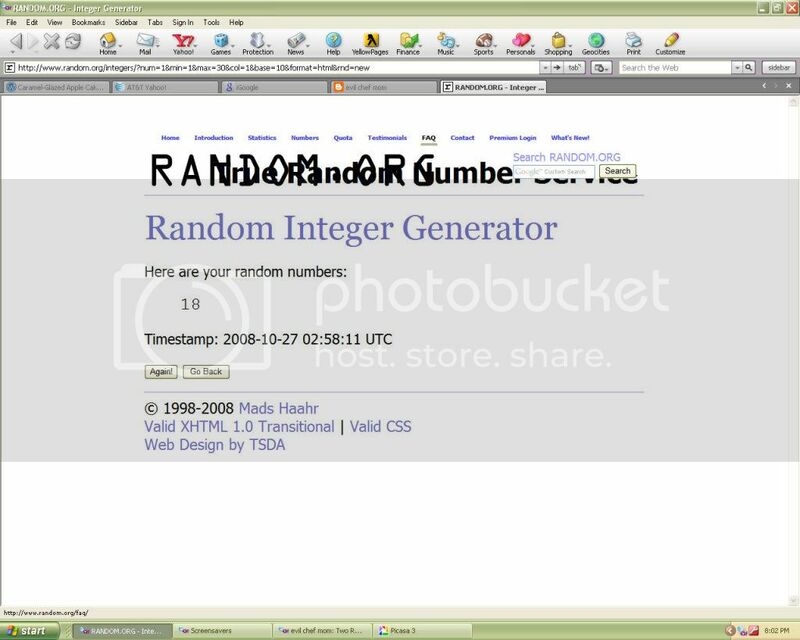 This is the first time EVER I've won anything randomly generated. Neato. Thank you, Krysta. I thinkI had a little too much fun coming up with rants. Probably because I compose them naturally in my head all damn day. You know, I purposely didn't do a rant. I mean, I was having a hard time coming up with one anyway, but I also wasn't interested in the prizes. You know, my tastes and all. ;) Congrats to the winners! A whopper of a story? I want to make a candy joke, but nothin's coming to me. Jeez. I think that was an excellent choice of winners. I loved the slug comment, and I actually felt guilty leaving my rant, after reading "too chicken to leave her name's" comment! I think I will stick to cooking and politics, and leave my personal feelings about my neighbor to myself next time! But thanks for giving us a forum to scream for a minute! OMG the slug story is just hysterical. And it's 10:45 where's my whopper story. I love the slug one! I should try to put it in a sign near my plants to see if it works.